Moderna Therapeutics seeks to create drugs that use messenger RNA to reprogram cells in the body to produce defenses against cancer. The company is based in Cambridge. Moderna Therapeutics Inc., which is pioneering a cancer-fighting technology that harnesses the immune system, Wednesday said it will receive $200 million in cash as part of an expanded licensing deal with drug giant Merck & Co. The money will help Cambridge-based Moderna move a portfolio of experimental drugs from early research and development to clinical trials, starting next year. It will also provide some of the financing for a Moderna manufacturing site in the Boston suburbs. Moderna has not yet settled on a location or said how many workers it would have there, but it plans to announce details later this year. The emerging field seeks to stimulate patients’ immune systems to fight cancers. Merck has become a leader among Big Pharma companies in developing immuno-therapies, while Moderna is experimenting with personalized cancer vaccines that could work by themselves or in combination with other medicines. Bancel said the company will bolster its vaccine manufacturing capability in two stages. 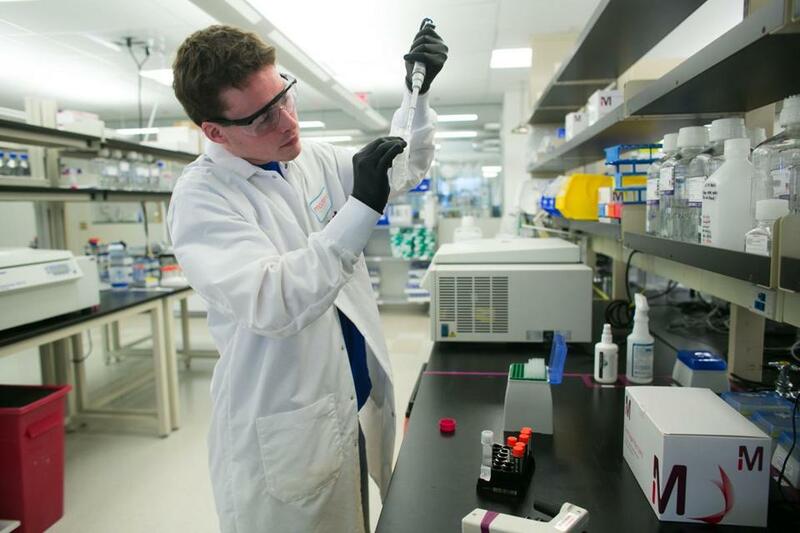 Initially, it will move production of its vaccines used in clinical trial from a lab in Cambridge to a contract manufacturing organization, which will also make vaccines used in the joint research program with Merck. By mid-2018, he said, Moderna will move into its own manufacturing plant capable of producing multiple approved cancer vaccines. 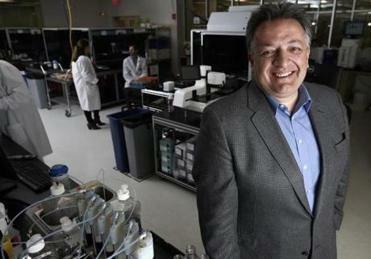 Noubar Afeyan of Flagship Ventures in a lab at Moderna Therapeutics. Four-year-old Moderna has about 320 employees in two sites near Kendall Square. It is working on “messenger RNA” technology that could rapidly produce dozens of drugs mimicking the body’s natural functions in fighting cancer and other diseases. When injected into patients, they would generate immune responses that destroy cancer cells. Merck, based in Kenilworth, N.J., already markets one of the most successful immuno-therapies, Keytruda, approved by the Food and Drug Administration last year to treat advanced melanoma and non-small cell lung cancer. Under the expanded collaboration with Moderna, it plans to experiment combining Keytruda with the Cambridge company’s personalized vaccines to make the drug more effective. Last year, Moderna received $450 million from an investment consortium in what was then called the largest private financing round ever in the biopharma industry. The company’s founders include Cambridge venture capital firm Flagship Ventures and Robert Langer, an institute professor at the Massachusetts Institute of Technology. Under their initial licensing agreement, announced in January at the J.P. Morgan HealthCare Conference, Merck will use Moderna technology to develop vaccines against viral diseases. At the time, Moderna also disclosed a $20 million grant from the Bill and Melinda Gates Foundation to help develop a new drug cocktail based on its mRNA technology to treat the HIV virus. The new deal with Merck involves multiple studies in several types of cancer, including studies that combine Moderna’s personalized vaccines with Keytruda. In addition to melanoma and lung cancer, the Merck drug has proved to be an active agent when tested in 20 other tumor types. Merck is awaiting an FDA decision in August on its application to use Keytruda as a treatment for head and neck cancer. Under the new deal, Merck reserves the option to share with Moderna the costs and profits of vaccines and combination cancer drugs that move forward after clinical trials. Robert Weisman can be reached at weisman@globe.com. Follow him on Twitter @GlobeRobW.